GIGABYTE announces support for the latest JEDEC standard DDR4 memory, single 32GB memory modules, on the GIGABYTE Z390 and C246 motherboards. This allows the GIGABYTE Z390 and C246 motherboards to support up to 128GB (4 x 32GB) total memory capacity on quad-DIMM configurations offering increased memory capacity for mainstream motherboard users. The support will require a BIOS update which is now available to the GIGABYTE Z390 and C246 motherboards. Additional BIOS updates will be rolled out for the rest of GIGABYTE’s Intel 300 Series motherboards shortly. 32GB memory modules per DIMM slot was primarily made available and limited to workstation-class motherboards with registered memory with the purpose of fulfilling memory-intensive tasks. With the release of the new JEDEC Standard, 32GB Unbuffered Memory DIMMs can now be supported by mainstream motherboards starting with the Intel Z390 chipset paired with the 9th generation Intel Core processors. 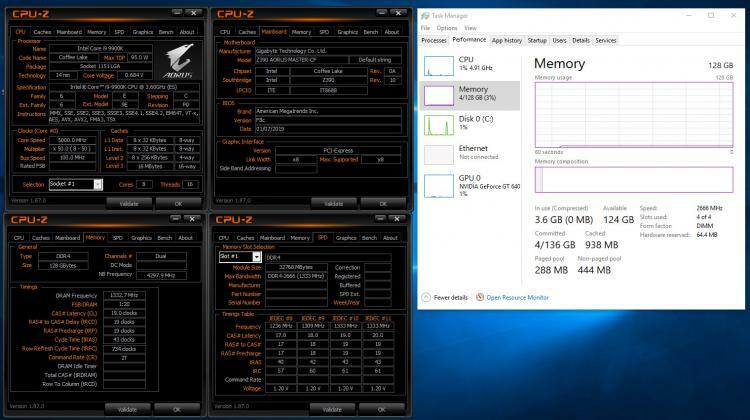 GIGABYTE has also extended the support to the C246 motherboard line to increase memory capacity for users the run memory-intensive tasks using such configuration. GIGABYTE is working closely with Intel to develop new BIOS updates for the rest of GIGABYTE’s Intel 300 series motherboards. To update the BIOS of your GIGABYTE Z390 or GIGABYTE C246 motherboard, simply visit the product page at GIGABYTE website and download the latest BIOS version at the Support section.